This quality Priday Red Moss Agate Lapidary Slab is an Oregon thunderegg featuring a small amount of red moss but more importantly a very nice yellow plume bouquet embedded in the clear chalcedony core. A beautiful specimen or cabbing piece. Measurements are 1/4×1.75×2.5 inches. Photographed wet. This rare Priday Red Moss Agate Lapidary Slab features a very nice green and red moss bouquet embedded in clear chalcedony. This slab is from an Oregon thunderegg and should produce an exceptional cab. Measurements are 3/16 x 2 x 2.25 inches. Photographed wet. This rare Priday Red Moss Agate Lapidary Slab features a very nice green and red moss bouquet embedded in clear chalcedony. This slab is from an Oregon thunderegg and should produce an exceptional cab. Measurements are 3/16 x 1.75 x 2.25 inches. Photographed wet. This elegant Purple Fluorite and Sterling Beaded Necklace features a large purple fluorite heart bead plus an array of smaller purple florite beads. The 36 inch sterling heishi tube beads necklace and matching earrings (with a 1.5 inch drop) add elegance to this set. This polished Purple Sage Lapidary Slab from Oregon features dramatic black, purple, and brown dendritic inclusions incuding spider web designs. A very nice polished display specimen or it can be cabbed. Measurements are 5x5x1/4 inches. Photographed dry. This colorful Rain Forrest Jasper Lapidary Slab features an array of brown, light green, and dark green patterns evenly distributed across the face. A quality cab producer. Measurements are 3.5x5x3/16 inches. Photographed wet. This high quality Rainbow Calsilica Designer Cabochon features an array of colors as in the rainbow. It’s a man made material but this is a solid piece with a high luster polish. A really nice cab for pendants. Measurements are 5 x 17 x 38 mm. This Rare Azurite Pendant Necklace features a large deep blue azurite stone mounted in sterling. The 22 inch necklace is made from round azurite and rondelle amethyst beads. The toggle clasp is sterling. Matching post sterling earrings have a one inch drop. This rare Priday Red Moss Agate Lapidary Slab features red and purple moss embedded in clear chalcedony. This slab is from an Oregon thunderegg and should produce an exceptional cab. Measurements are 1/4x2x2.5 inches. Photographed wet. These are assorted sizes of West Texas Red Plume Agate Designer Cabochons. The price is per cab. Please click “CONTACT US” and send an email if you need the exact dimensions or a more detailed description of the cabochon you like. After completing your purchase, please email us the number of your cabochon and it will be shipped. 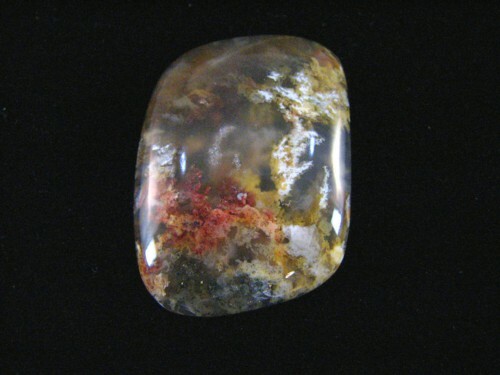 This Regency Plume Agate Designer Cabochon has red, white, and yellow plumes scattered throughout its bluish translucent chalcedony background. These plumes have created a colorful exotic floral scene that will be the focus for any piece of jewelry. 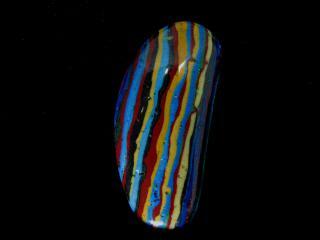 This 24x32mm cabochon is professionally cut, highly polished, and beveled to facilitate setting. It was found in South East Oregon. 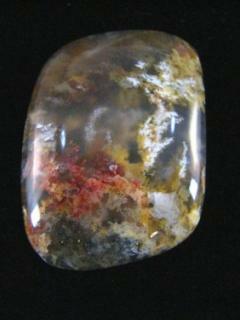 This is a great cabochon for exotic fashion jewelry. This Regency Plume Agate Lapidary Slab from Oregon features muted yellow, pink, and marcasite plumes and should produce a nice cab. Measurements are 1/4x2x2 inches. Photographed wet.